Flowers and leaves at Lahaina, Maui, Hawaii (USA). July 13, 2009. Origin and Habitat: Portulaca grandiflora is native to Brazil, Uruguay and Argentina (South to Chubut), sparingly escaped from cultivation and naturalized in the United States, Europe, and elsewhere in frost-free climates. Altitude range: 0-2000 metres above sea level. Habitat and ecology: Sandy soils. Portulaca grandiflora is naturalized in gardens and often becomes a weed around houses and has escaped to roadsides and waste places. Portulaca mendocinensis Gillies ex Hook. Portulaca immersostellulata var. galanderi Poelln. 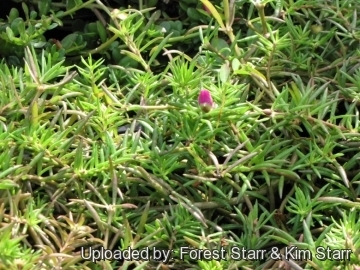 Portulaca immersostellulata var. uruguayensis Poelln. Description: Portulaca grandiflora, the well-known "Garden Purslane" or "Moss rose" is an dwarf, annual or weak perennial succulent herb from a small taproot. It forms mats only 15 cm in height, with a spread of 60 cm. It produces masses of satiny, flowers, in white, cream, yellow, orange, red, pink, bronze or purple and sometimes double or multicoloured. The flowers, which open only in bright sunlight, close at night and on cloudy days. The French name "Chevalier de onze heures" arises from the regularity with which the flowers open at midmorning (11 o’clock). Don't confuse this plant with the annual weed also known as portulaca or purslane. They are both sun-loving and succulent and are members of the same genus, but the similarities end there. While purslane (Portulaca oleracea) is a pernicious and prolific weed, moss rose (Portulaca grandiflora) is a delightful, easy-to-care-for bedding plant. Derivation of specific name: The genus Portulaca was named by Linnaeus, who observed that the lid of the seed capsule opened like a gate. Portula is Latin for little gate, while the specific epithet, grandiflora, means large-flowered. Roots: Fibrous or with irregular thickenings. Stems:Succulent, ascending to spreading, branched mostly from near the base to 20(-35) cm long, pubescent at least at the nodes and in inflorescence. Internodes more or less long. Leaves: Alternate, simple, often crowded, fleshy, needle-like, terete, tapering towards apex, 10-30 mm long, (1.5-)2-2.5(-3) mm broad, entire, apex acute or subacute, glabrous, blue green often with a reddish ting. Axillary hairs few to abundant, mostly shorter than leaves, whitish-woolly. Inflorescences: Congested, surrounded by 8-10(-14) involucre-like leaves. Flower: Often solitary, showy, variously colored, sometimes double-flowered, 2-4(-5.5) cm across. Sepals 2, free or united at the base, obtuse, scarious along the margins, 3-5 mm long. Petals 5 (many in double-flowered forms), free, obovate, entire or erose, 15–25 mm long, 15–20 mm wide. Stamens about 40 or more. Styles 5-9, whitish. The range of flower's colours was selected from the wild form, which shows uniform pink-magenta petals over vast parts of its range in Argentina, with just occasional specimens with aberrant flower colours. Blooming season: Late spring to frost. Fruits (capsules): Ovoid or semiglobose (3.5–)4-6(-8) mm in diameter, dehiscent at, operculum. Seeds. Many, reniform, orbiculate or elongate, flattened, (0.5)0.75-1(-1.5) mm long, steely grey to black, sometimes iridescent or some-what glossy. 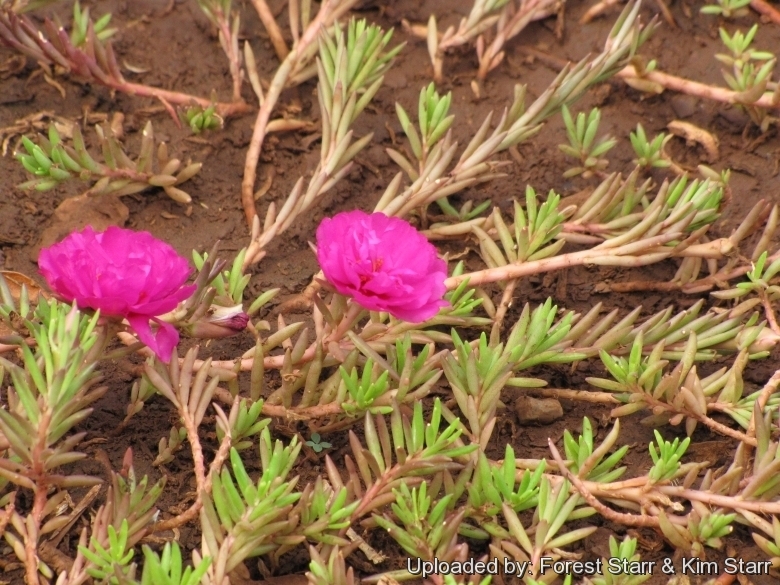 Cultivation and Propagation: Portulaca grandiflora, is widely grown in temperate climates as an ornamental plant for annual bedding or as a container plant. 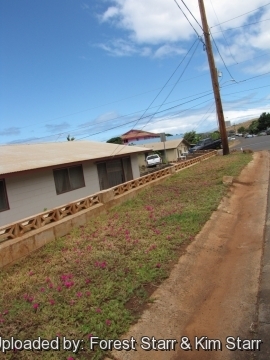 It requires ample sunlight and well-drained soils. It requires almost no attention and spreads itself very easily. Although it survives difficult conditions, plants will produce more lush growth and flowers when provided sufficient moisture and rich soils. In places with old architecture it can grow between the stones of the road or sidewalk. Soils: It grows well in poor, sandy or gravelly soils. The soil must be very well-drained. Exposure: It needs full sun to flower. Waterings: It is drought tolerant, but flowers best with regular watering. Don't water with overhead irrigation, which can damage the flowers. 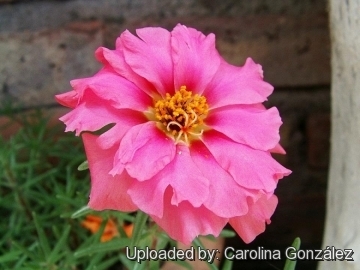 Hardiness: Plant seeds or set out moss rose plants after all danger of frost has passed. Pests and diseases: No serious insect or disease problems. Watch for aphids. Stem or root rots can be a problem in wet soils. Garden Uses: Good for poor dry soils where many other plants struggle. Edging or ground cover for beds, rock gardens or along walks. Containers, hanging baskets. Sprawl over stone walls. Maintenance: Pinching or deadheading will promote greater flowering and reduce reseeding. Plants can be pruned or sheared in midseason if they begin to look straggly for a neater appearance and to promote fuller growth. *Propagation: Sow seed directly in the garden after last frost date, or start indoors 6-8 weeks earlier. Set out seedlings and purchased plants at last frost date. Plants may self-seed. Seeds are as tiny as dust, so mix them with sand before sowing to make them easier to scatter. Seeds germination period, requires one to two weeks. 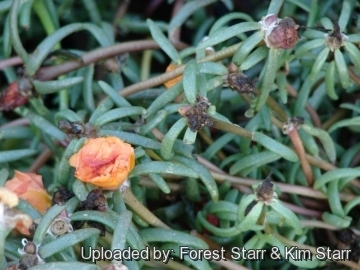 In warm climates, Portulaca grandiflora may self-seed. Established plants can also be propagated by cuttings.